You can major in art at a lower-tier public university if you want to. Just don't expect it to make you rich. 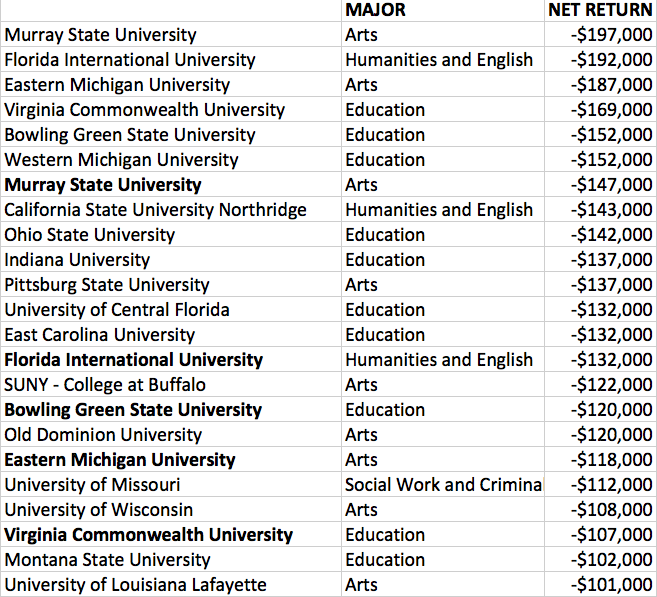 Here are the eleven schools in PayScale's data with a 20-year net return worse than negative-$30,000. In other words: these are the schools where PayScale determined that not going to college is at least $30,000 more valuable than taking the time to pay for and graduate from one of these schools. Second, PayScale calculates the next 20 years in earnings by inferring from the last 20 years. Sounds reasonable. But like any assumption, this carries risks. The "most coveted major" changes from time to time. If biomedical engineering becomes the next big VC category, scientists in California will be in higher demand than software engineers, whose earnings forecast might fall. PayScale can't predict that future. Moreover, if a school dramatically expanded a high-value program (like engineering) in the last five years, it might raise the financial value of its students in a way that PayScale doesn't full account for, since this research looks back two decades. In short, like most studies of this kind, the findings are fascinating and worth remembering and quoting—but also worth contextualizing. 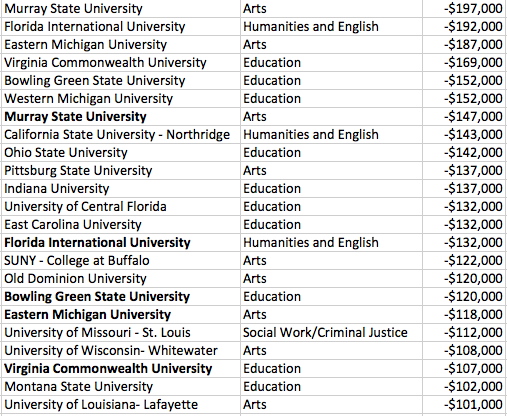 Finally, as Jordan Weissmann notes, PayScale can tell us which colleges graduate the richest students. But it can't tell us which colleges make the biggest delta in student outcomes, which might be a more important question for college counselors and families. For that, you would need to study a huge group of similar kids, some of whom went to great colleges, some to middling colleges, and some to bad ones, and measure the difference. When we measure lifetime earnings of students graduating from elite (and poor) colleges, we're measuring both the quality of the college and the earnings potential of the student attending that college before they stepped foot on campus. Correction: This article initially misidentified the University of Missouri - St. Louis as the University of Missouri in the second chart.